When a customer user submits an order, they provide the shipping address and, optionally, the Do Not Ship Later Than date. Based on this information and their selected shipping method, they may see the shipping cost estimate. 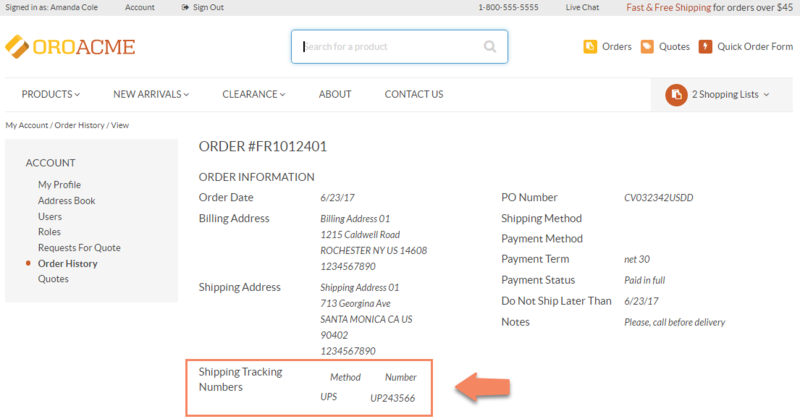 After a salesperson adds the shipping service and their tracking number to the order, the customer user can track the delivery (if this option is provided by the shipping company). Navigate to Sales > Orders using the main menu. Click on the necessary order to view its details. Enter the shipping method (e.g., UPS) and the tracking number. Some orders may be delivered in multiple portions due to the circumstances related to the delivery time or delivered volume. To provide tracking details for additional shipping, click +Add and enter the method and tracking number. After the tracking information for shipping has been provided, it becomes available to the buyer in the storefront.